It happens all the time: a brand’s celebrity spokesperson finds him/herself at the center of a controversy, which unwittingly generates negative publicity for the endorsing brand. 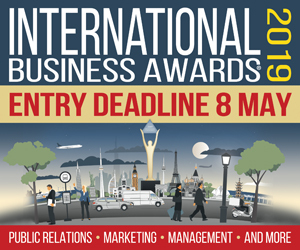 While currently one of marketers’ preferred avenues for driving brand awareness and boosting sales, celebrity endorsement remains a practice area also wrought with challenges, chief among them being the liabilities they present when celebrities behave poorly, and what disastrous effects these crises can have on a company’s reputation and stock returns. Now, new research sheds some light on what economic effects a company’s reaction to these unforeseen events might have. The study, which was conducted jointly by researchers at the University of Connecticut and Free University of Berlin, analyzed 128 separate instances between 1988 and 2016 involving a celebrity endorser who generated negative publicity while being under contract with a publicly-traded company. The study then evaluated the varying reactions from the 230 companies affected (suspend or maintain the spokesperson relationship, or offer no response at all) as well as response time (slow vs. fast), to identify how those responses corresponded with daily gains or losses in the company’s stock in the financial markets. Aside from yielding some actionable insights regarding best steps and response time for brands that find themselves in the midst of a spokesperson controversy, the study also yielded a surprise finding: depending on their response to the event, brands can actually gain value following an incident in which a celebrity endorser generated negative publicity. As with everything in a crisis, timing is key. In analyzing companies’ speed of response, the nature of its response, and how that response impacted returns, the study discovered that a faster announcement or statement after an incident of negative publicity saw company value increasing by 2.10 percent over the next four trading weeks. According to researchers, these positive effects held for different types of responses to endorser-related scandals. New research shows that brands can actually gain value if they respond quickly to negative publicity surrounding a celebrity endorser. These results are predicated on a fast response time. 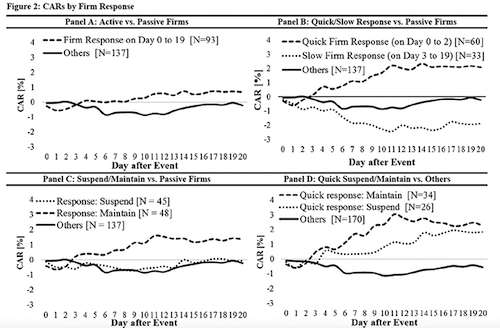 The study found the “window of opportunity” for companies responding to a negative event is relatively small, and that the positive effects of a firm’s response on the daily abnormal stock returns begin diminishing quickly (by -.184 percent) about 72 hours after the negative event becomes public. After that, a response thereafter becomes ineffective, and “this diminishing effect becomes increasingly more negative with each day the firm does not respond,” the study’s authors wrote. One thing’s for sure: a response is always warranted. The study discovered that some definitive action on behalf of a company is always better than offering no response at all. Regardless of whether the company chooses to suspend or maintain its relationship with the endorser, issuing a statement announcing its plans is more likely to yield positive abnormal stock returns than remaining quiet. Finally, the study’s authors warned that simply because these findings suggest that companies can actually gain value when responding to an endorser-related crisis, that shouldn’t suggest companies do something to artificially cause a negative event, simply so they can quickly respond to it. The report, “Managing Negative Celebrity Endorser Publicity: How Announcements of Firm (Non) Responses Impact Stock Returns,” appears in Management Science, a peer-reviewed journal published by the Institute for Operational Research and the Management Sciences (INFORMS).